The AZATOM Multiplex D1 is an FM/DAB/DAB+ radio with stereo speakers. It’s fairly powerful and would be ideal for using in the living room, but it’s also portable thanks to the built-in battery. The AZATOM Multiplex D1 feels solidly build and looks high quality. You might be surprised at how small it is (27 cm wide), as you generally expect stereo radios to be bigger. Nevertheless, it offers a good amount of power and a decent level of bass for its size. The speakers have a nice warm sound, which can be easily adjusted using the EQ controls. The power provided by the speakers should be enough for a fairly large living room. The Multiplex D1 connects to your phone via Bluetooth quickly and easily. 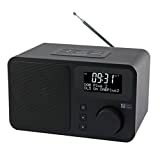 If you’ve been thinking about getting an internet radio, a cheaper alternative could be to simply get a DAB radio with Bluetooth and stream internet radio through it from your phone using Bluetooth. The built-in battery gives about 8-10 hours of playback time on a full charge. The radio can also be plugged into the mains. The USB charging point is very convenient for charging an iPhone or other smartphone. The AZATOM Multiplex D1 is a very versatile radio with a great list of features. It’s one of the best DAB radios in terms of value for money. It’s backed by a one-year warranty which should provide you with some peace of mind if you’re worried about its reliability. AZATOM really ought to improve the instructions manual that comes with this product, as it’s incomplete and written in bad English, despite AZATOM claiming to be a UK-based brand. This product is made in China, and I suspect the company is based in China with the UK office being mainly for branding purposes. The Multiplex D1’s key features are FM/DAB/DAB+ radio, Bluetooth and USB charging. There are a few other radios available with these same features. One is the Roberts Radio Blutune 50 . It’s more expensive than the Multiplex D1, but Roberts is a more established brand than AZATOM. Like the Multiplex D1, the Blutune 50 has stereo speakers, which have a slightly richer sound than those of the AZATOM radio. 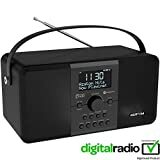 Another option is the Castle DAB Digital FM Radio. This product features a CD player as well as FM/DAB radio, Bluetooth and two USB charging ports. It’s more expensive than the Multiplex D1 at the time of writing, but the addition of a CD player and two instead of one charging points makes it good value for money.